What started as a poorly received film has become Cartoon Network's prime jewel. Over the past 5 years, Star Wars: The Clone Wars has become the #1 Animated action show in it's timeslot, in it's intended age group (Boys 8-14) for the past 5 years, and it has taken the entire family along for the ride. Back in 2007, when the series was nothing more than pure fan speculation, Lucas made one thing very clear: They were going to make at 100 episodes. Whether the series was cancelled before then did not matter-they would put the episodes out on DVD, but 100 episodes was the goal. 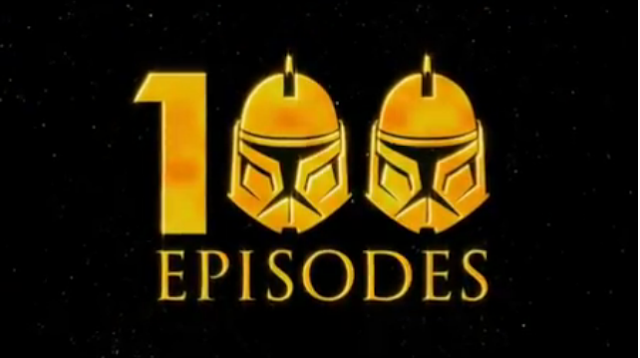 Now, on January 5th, Lucas will meet his goal by hitting the 100th episode of Star Wars The Clone Wars. The episode will be called "Missing in Action". It is the 11th episode of Season 5, and the third in the "Droids Arc". This episode will feature a Republic Commando named "Gregor" who has lost his memory and has been serving as a dish-washer. Ever since the series came out, fans have been screaming for certain things to appear on the show. Aside from Wookiees (which now appear somewhat regularly), Republic Commandos were by far one of the most requested items fans wanted to see. Fans were given a taste of Commandos in "Witches of the Mist", when Delta Squad (from the Star Wars: Republic Commando game) made a brief cameo. When Fixer, Scorch, Sev, and Boss appeared on the screen for the first time at Star Wars Celebration V, the crowd went nuts. However, their appearance was only for a brief minute, and since then, Commandos have not been seen. Now we get a completely original Commando, and one with no memory. It should be interesting to see where they go with this. Since their "minimum" goal has been met, Lucas and his crew have since stated that as long as people keep watching the show, they will keep making it. A sixth season has been confirmed with a seventh (and rumored last) season being been hinted at. Check out Supervising Director Dave Filoni's reflection on making it to 100 episodes here.